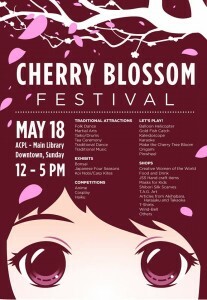 Posted on May 13, 2014 at 10:00:21 am by Wendy S.
The 8th Annual Japanese Cherry Blossom Festival will be held on Sunday, May 18, at the main branch of the Allen County Public Library. 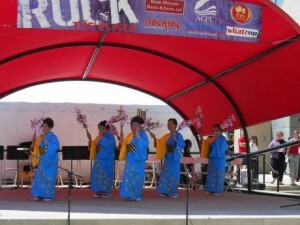 The festival is a celebration of all things Japanese in northeast Indiana, including Fort Wayne&apos;s Sister City relationship with Takaoka, Japan. 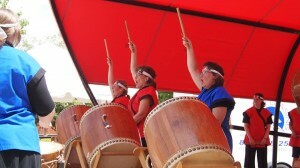 The festival runs from 12 p.m. to 5 p.m. Fort Wayne Taiko, with the festival since its first year, will kick off the day at 12 noon in the Library Plaza, with opening ceremonies following at 12:15 p.m., during which the Suzuki String Orchestra of Fort Wayne will perform. Indiana Guitar Trio, led by Dr. Daniel Quinn, will perform Japanese guitar music. The "Dueling Divas," Janice Furtner and Dorothy Kittaka, sopranos, will sing Japanese vocal music duets with Irene Ator, pianist. 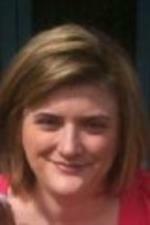 Farrell Vernon, saxophone, will perform music of Japanese composers. Shie Otani, an expert in Japanese Tea Ceremonies, will again grace the festival with a traditional Japanese Tea Ceremony with participation of audience members. Takaoka, Japan artwork (65 pieces) by elementary and middle school students who participated in FAME’s Fusion of Concert Colors will be exhibited. Don&apos;t forget the on-site contests! Anime Art! Draw a famous anime character or your own original character for prizes. Can You Haiku? Students will submit work prior to the festival. Finalists from the schools will have their haiku displayed and will be invited to read their haiku at the festival. The public may also compose haiku at the festival for prizes. CosPlay Competition! Wear costumes depicting your favorite anime character for prizes. Details Date: Sunday, May 18 Time: 12 p.m. - 5 p.m. Location: Main Branch ACPL- 900 Library Plaza Admission: Free Donations will be accepted. Refreshments, books, textiles and a variety of hand-made items will be available for purchase in the festival marketplace. Sponsors: Fort Wayne Sister Cities International, Japanese American Association of Indiana, Fort Wayne Dance Collective, Allen County Public Library Click here for this year&apos;s festival brochure!